This Nobel Prize inspired Pauling-therapy drink mix is safe, proven -- and effective! 30 servings per jar. 1 to 3 servings recommended daily. Pleasant-tasting -- a hypoallergenic vitamin C drink mix enhanced with stevia. No GMO. Pure -- premium ingredients. No fillers, glues, or additives to hold pills together. Certified 100% corn free. Convenient -- one jar replaces more than 300 pills. Economical -- on autoship your cost is less than 1 dollar (.80 cents) per day. Includes the hard-to-find amino acid proline. Prevention strength -- For people with healthy hearts and who want to remain that way. Pauling's specific vitamin C, lysine and proline recommendations for the prevention of CVD. Combine with your favorite multivitamin and multimineral products -- no conflict with most other nutritional products. For even more strength, add Vitamin C Foundation Vitamin C to each serving. Ø Cardio-C® is a pharmaceutical grade Lp(a) Binding Inhibitor based upon the Pauling Therapy for cardiovascular disease. Dr. Linus Pauling, the founder of modern Chemistry, the holder of 48 honorary Ph.D.s, and the world's only 2-time unshared Nobel prize laureate, alerted the world that Chronic Scurvy, a low-grade, sub clinical vitamin C deficiency, leads to damaged blood vessels, altherosclerosis, and heart attacks. Pauling believed that too little vitamin C leads to elevated cholesterol, especially the Lp(a) variant of LDL (bad) cholesterol that causes atherosclerotic plaque build-ups in arteries. Linus Pauling claimed that he and Dr. Matthias Rath's invention, specific non-toxic Lp(a) binding inhibitors, at high doses, will prevent and even dissolve arterial blockages. This claim has been given no press and medicine refuses to study it. Ø Cardio-C® is made from the finest ingredients and the mix contains more vitamin C, lysine and proline per serving than all competing products. Cardio-C® makes the best tasting drink, and the product is certified GMO free. 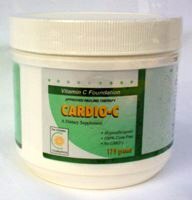 Note: The Vitamin C used in Cardio-C® is DSM Quali-C manufactured in Europe. Following Linus Paulings recommendations are now as easy as 1, 2 or 3 drinks daily. This pleasant tasting powdered drink mix achieves high potency while eliminating lots of pills. This means that you aren't consuming unecessary fillers, glues and additives that would be required to hold scores of pills together. It works! Patients easily attain Pauling's recommended preventive dosage, and 2 to 3 drinks provide maximum benefits. Testimonials of amazing results are at PaulingTherapy.com. Technical information is on the video: Linus Pauling on Heart Disease: A Unified Theory of Cause and Cure which can also be ordered by calling 800-894-9025. Use at your own risk. Neither the FDA nor the Medical Profession accept the proposition put forth by Pauling, Rath, Levy and others that the root cause of cardiovascular disease is an acute vitamin C deficiency at the site of the arterial lesion. Cardio-C ® is a registered trademark of Intelisoft Multimedia, Inc. The product is manufactured and bottled at at FDA certified Douglas Laboratories. Safe for diabetics. Not made from animal sources. Certificate of Analysis and Microbiological analysis provided upon request. All ingredients are certified GMO free, Product contains no fillers or additives. One jar contains 30 servings. Replaces over 300 monthly pills. Dietary supplement. These statements have not been evaluated by the U.S Food and Drug Administration.